The First Annual Retrospective Report provides a deeper understanding of how retrospectives are used in the real world. 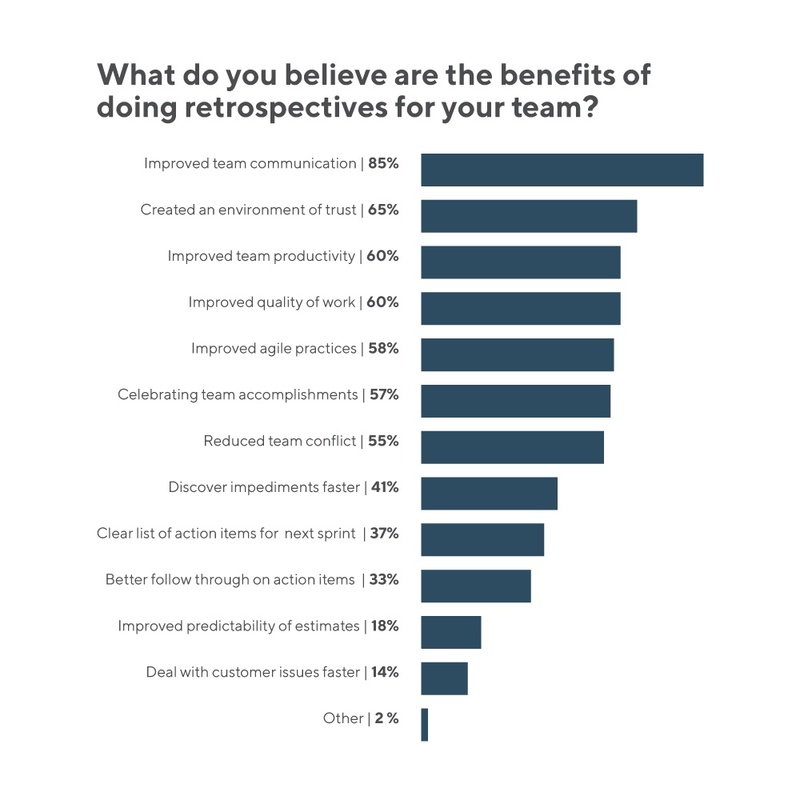 Based on over 275 survey responses from around the globe, the results indicate that retrospectives lead to improved team communication and productivity and help to create an environment of trust. Major challenges include the fact that topics discussed cannot be solved by the team, and that people do not feel comfortable speaking up. The adoption of different techniques in retrospectives is low; most retrospectives are still done by questioning "what went well and what didn’t go well". Retrium (...) today announced the release of the first Annual Agile Retrospective Report from the Agile2017 Conference. The first survey of its kind, the Annual Agile Retrospective Report sheds light on how agile team members around the world are using retrospectives, the benefits they realize, the challenges they overcome and the opportunity for retrospectives to help drive teams’ continuous improvement. The survey on agile retrospectives has been done by Retrium, a provider of online retrospectives services. InfoQ: What made you decide to run a survey on agile retrospectives? David Horowitz: It’s simple really: retrospectives are the core of agile, and yet their usage has never been studied or analyzed in a systematic way. At Retrium, helping organizations continuously improve via the retrospective is the very purpose of our existence. As a result, we spend a lot of time thinking about the role retrospectives play in helping teams and organizations realize their full potential. It’s what we talk about in team meetings, in conference calls with customers, and with our peers and colleagues in the agile space. These conversations have always been filled with anecdotal stories about how retrospectives are - and frequently aren’t - working well for teams and organizations. But given the importance of the retrospective, anecdotes simply aren’t good enough. The more we thought about it, the more we realized that the use of retrospectives in our industry needed to be studied in a more structured and formal way to document trends over time, prove pain points, and identify opportunities going forward. As a result, from March to April of this year, we asked people around the world to answer our first-of-a-kind survey. We are thrilled by the response we saw to the first survey - 277 responses were received from agilist around the world and 85% of those responses came from individuals who are not Retrium customers. InfoQ: Which benefits do retrospectives bring, according to the survey? Any surprises in the answers that people gave? Horowitz: From the survey responses, the top five benefits that teams realize from their retrospectives are improved team communication (85%), creating an environment of trust (65%), improved team productivity (60%), improved quality of work (60%) and improved agile practices (58%). I find these responses to be especially reassuring as we all know that the purpose of retrospectives is to help teams tune and adjust their practices. It looks like we’re on the right path. However, the responses become more interesting and point to a larger opportunity when you look at the three least popular responses - better follow through on action items from previous sprint (33%), improved predictability of estimates (18%) and deal with customer issues faster (14%). As a business owner, I’m keenly aware of the fact that there is room for improvement as speed and predictability are critical to the organization’s ability to deliver. Similarly, the fact that teams frequently fail to follow through on their action items points to a need for a solution that facilitates this type of engagement easily. InfoQ: What are the biggest challenges running retrospectives? How can facilitators and teams deal with them? Horowitz: It’s difficult to change the way teams operate, and that’s true for agile retrospectives, too. I’ll share the exact results from the survey, but I want to call out the fact that the top three challenges all deal with the team’s ability to collaborate effectively. Specifically, topics discussed cannot be solved by the team (48%), people don’t feel comfortable speaking up (44%), and the team is distributed across different locations (36%). Plus, three of the top five challenges directly relate to the ability for everyone to share their experiences regardless of location, personality or any other factors that may discourage participation. If we look at the least frequently cited challenges, a more concerning trend emerges. 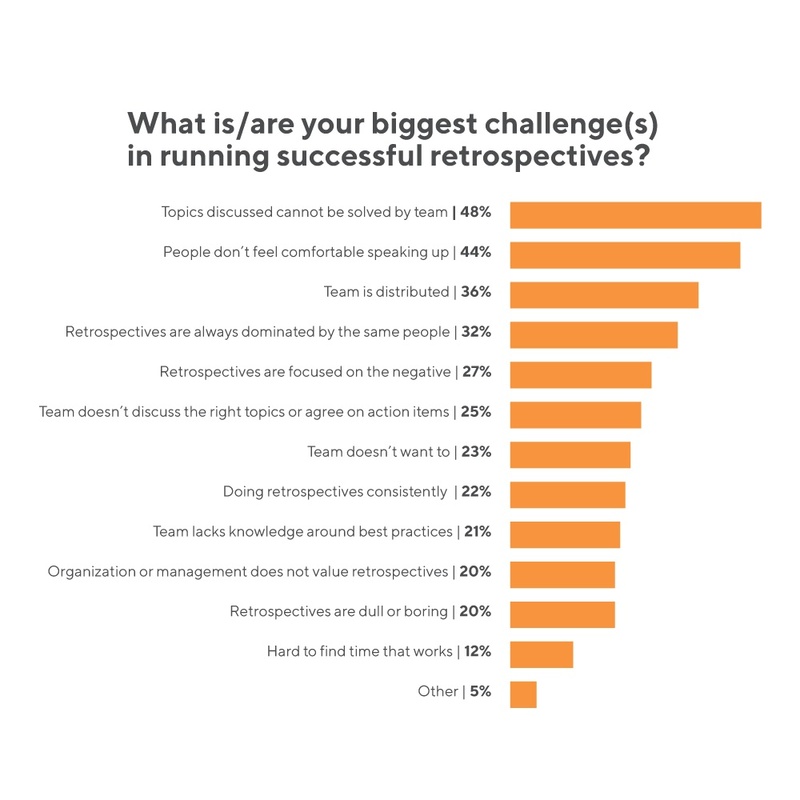 In fact, over one out of every five respondents said that their teams don’t want to retrospect at all or that their organization doesn’t support running retrospectives. That’s a clear disconnect. If an organization is using agile principles in an effort to become more effective, not supporting or encouraging retrospectives at the team or corporate level is in direct contrast to that goal. And here lies an opportunity - by understanding the value of retrospectives as the core of agility and by pushing for the adoption of retrospectives, organizations can expect real change and continuous improvement. InfoQ: Retrospectives are mostly facilitated by the Scrum master. How do you feel about that? Horowitz: As with everything else in agile, it should be up to the team. In other words, if your retrospectives are already functioning at a high level, then great! Don’t change anything. If, however, you are struggling to inject some energy into your retrospectives, or your teams are looking for new and innovative ways to retrospect, rotating the role of the facilitator can help. Since becoming an effective facilitator is not simple or easy, it’s important to keep it on a volunteer-only basis. You certainly don’t want to force anyone to do something they aren’t interested in. Keep in mind that rotating the role of the facilitator doesn’t have to be limited to members of your team. I’m a big fan of creating a Circle of Facilitators on a company-wide basis. I wrote a blog post about that idea, but, in summary, the idea is for Scrum Masters to facilitate the retrospectives of other teams in their organization in order to bring new ideas, share lessons learned, and remove as many opportunities for influence as possible. InfoQ: Most retrospectives are done by questioning "what went well and what didn’t go well". Isn’t that surprising, given that there are hundreds of different techniques that can be used? What keeps people from using them? Horowitz: It’s clearly not a surprise that that’s the most common technique and the survey proves it with 88% of respondents indicating they have used it as either a facilitator or participant, including a whopping 46% saying it was their most commonly used technique. You’re also right that there are countless other techniques teams can use, but don’t. Perhaps the reason why most teams stick to "what went well and what didn’t go well" is that teams, companies, and even our industry aren’t placing sufficient emphasis on the value of the retrospective. It becomes a Catch 22. People complain that their retrospectives are boring, but don’t put time and effort into learning new techniques to help overcome the lack of engagement. And because they don’t learn new techniques, their retrospectives remain boring. We need to break this vicious cycle. Unfortunately, just saying, "use a wider variety of techniques!" doesn’t seem to work. Instead, it’s up to us to prove the value of the retrospective, even via its most basic "what went well and what didn’t go well" format. If people find that their retrospectives are driving real change, they will become more interested in learning new and innovative techniques. Here’s the best way of reinforcing the value of the retrospective: get some "simple wins" by focusing on follow-through. After all, what’s the point of the retrospective if not to improve? InfoQ: What do you expect that the future will bring for agile retrospectives? Horowitz: I strongly believe you’ll continue to see broader recognition of the central role retrospectives play as catalysts of continuous improvement. Employees need an outlet for their voice. A way to share their experiences, pain points and learnings with the rest of the organization. But the reality is that their voices will fall flat without buy-in from management. Management needs to do more than just listen to feedback; they need to commit to taking action in response to the issues that are raised. Without this dialogue and resulting action across all levels of the organization, you can expect minimal, if any, move to better agility and continuous improvement. This is where the opportunity for retrospectives is greatest. The current environment is ripe for a change. We all need to place greater emphasis on building cultures that are safe and open to feedback, and retrospectives have an important part to play there. By providing environments for team members to openly share their experiences, turning those experiences into actionable learnings, sharing feedback with the larger organization, and empowering teams to solve problems we’ll see the value of retrospectives continue to flourish in agile companies. Especially as enterprises continue to become more and more distributed, the need for successful retrospectives only grows.